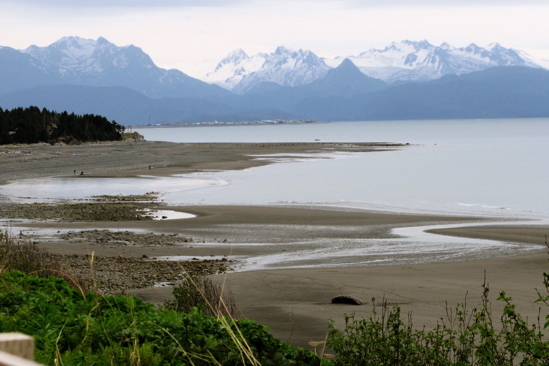 Homer, where we spent a couple of days earlier this week, is the hub of halibut fishing. The legendary Spit is lined with signs advertising halibut charters. 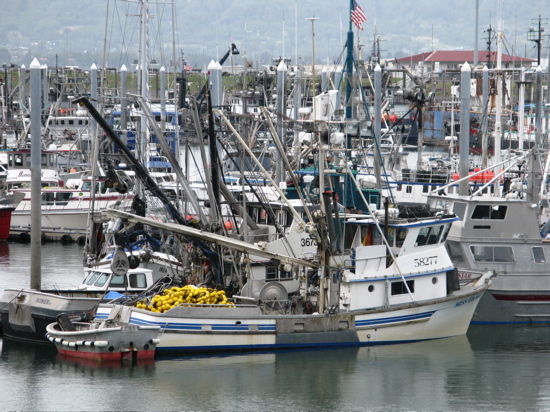 Hundreds of commercial fishing boats fill the harbor. Several processing plants do nothing but pack and freeze fish to ship around the world. It seemed like the perfect place to find a nice chunk of fish for the seafood chowder recipe I had brought with me from California. Yet finding fish that wasn’t frozen as hard as a chunk of marble proved daunting. The supermarkets didn’t have any fresh local fish. When I went to the market on the spit recommended by the manager of the campground where I was staying, it didn’t have any fresh halibut either. The case was filled with frozen fillets. “Don’t you have any fresh fish,” I asked? “It’s fresh frozen,” the young clerk replied. Now I know that flash frozen fish is pretty good. It’s certainly better than fish that has been sitting around in a cold case for a couple of days. But it still doesn’t compare with the firm texture and sweet flavor of fish that’s just been pulled from the sea. So I kept looking. Down the street, there was another processor that touted its fresh halibut. But the shop was locked and a sign on the door suggested calling for assistance. When I dialed the number, the man who answered said he did have fresh fish but he wouldn’t be back to his business until the next day. I would be gone by then, headed north to Tok, and I began to despair of cooking the chowder I had been anticipating for weeks. Luckily for me, Joe of Kachemack Bay Seafood was walking by and overheard my cell phone conversation. “I can get you some fresh halibut,” he offered. I followed him to his little shop, hidden near the docks, where he pulled a glistening halibut out of an ice chest and expertly cut off a fillet just the size I wanted. I thanked him profusely and took my beautiful piece of fish back to the camper, where I made this elegantly simple chowder on the two-burner propane stove. Light and fresh, it was the perfect showcase for this impeccably fresh fish. Resist the urge to add too much seasoning or take measures to thicken the broth. You want the sweet, slightly briny flavor of the fish to sing out in this dish. 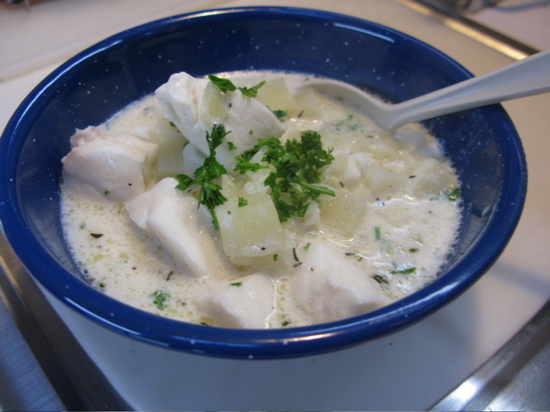 Halibut, firm and mildly flavored, is my choice for the chowder but any firm, white-fleshed fish would be good. Just be sure not to overcook it. Of course, fresh fish is best. In a large saucepan, slowly cook onions in butter until soft and golden. Add potatoes and cover with milk and stock. Season with a pinch of salt and simmer slowly until potatoes are tender, about 20 minutes. Cut the fish into 1-inch pieces and add to pot along with pepper, parsley and thyme. Cook gently until the fish flakes, usually about 5 minutes. Do not allow chowder to boil. Adjust seasonings and serve. Yum! I’m gonna be heading to the Marina Market for some fresh fish and try this one out. Homer. A drinking town with a fishing problem. I think you’re supposed to go out on the pier and catch one yourself. Great story, though, and thank heaven for Joe!